Landing pages are a balancing act, as we try to learn as much about our visitors as possible, without destroying our conversion rates in the process. Form fields are a vital part of this equation, and essential for unlocking vital lead insights; but it's common knowledge that the more form fields you have, the lower your conversion rates. So where's the sweet spot? How many form fields should your landing pages actually have? When a visitor clicks through to a landing page, they want something from you, be it an eBook, blog subscription, free trial or product demo. Unfortunately for your visitor, there's a barrier in the way: your landing page's form fields. In order to get their eBook or trial, your visitors have to part with their personal information. Visitors don't know or trust the company they're engaging with. The value and quality of the landing pager offer isn't clear. As a result, there's a trade-off at play, and the success of your landing page will be determined by a single question: is the risk of sharing my personal information worth the reward of their offer? "Is the risk of sharing personal information worth the reward of your offer?" In order to improve our landing page conversion rates, we need to improve the risk:reward ratio of our landing pages. One way to do this is to increase the value of our offer, promoting a more detailed eBook, or a longer trial. However, value is subjective, and hard to quantify; and it's often easier to reduce the perceived risk of the transaction. The easiest way to do this is to reduce the number of form fields visitors are required to fill-in. The less personal information required of your visitor, the lower the perceived risk: and, as HubSpot and Eloqua can testify to, the greater the conversion rates. The below graph is the product of HubSpot's analysis of over 40,000 landing pages. There's a clear trend on display: as the number of form fields increases, conversion rates decrease. This second graph is the result of Eloqua's analysis of 1,500 landing pages. Like HubSpot's findings, there's a clear negative correlation between the number of form fields present, and conversion rates. That data seems pretty conclusive, right? If we want to increase landing page conversion rates, we need to reduce the number of form fields present. This is the same conclusion CRO experts Unbounce reached - right until they analysed their own not-insignificant database. As before, conversion rates were highest with only one form field, and decreased with each additional form field; but, after leveling out between four and seven form fields, conversion rates began to climb again. 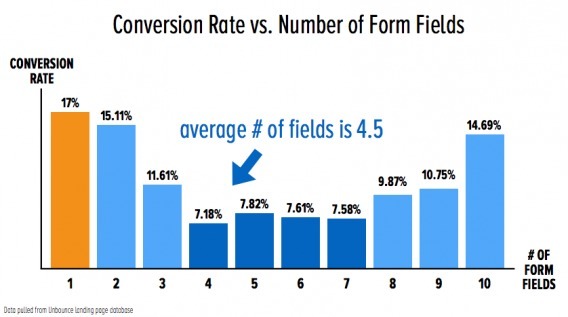 In this instance, ten form fields actually saw greater conversion rates than three.  It's fair to hypothesise that sometimes, visitors will want to fill out more form fields. Not all landing pages are created equal, and in some cases, form fields are provided as much for the benefit of the visitor as for the company behind the landing page. For example, let's compare an eBook download with a landing page for a free marketing assessment. The end-goal of the download is for a visitor to receive an eBook. There's no inherent need to provide any personal information, and everything the visitor shares is perceived as being for the benefit of the business behind the landing page. The end-goal of the assessment is different, and to maximise the benefit the visitor will get from the assessment, it's actually better to provide the company running the assessment with as much information as possible. The assessment is designed to be tailor-made to the visitor's own needs - and to do a decent job of that, it's important for the assessing company to understand the visitor. In the case of the eBook, we'd expect conversion rates to decrease as the number of form fields increases; but for the assessment, more form fields means more detail, and a better assessment. Adding form fields that the visitor values may therefore increase conversions. Simply put, there are no hard-and-fast conversion rate rules. No matter how much third-party data you analyse, and no matter how many industry standard benchmarks you consult, there are simply too many variables at work to adopt a one-size-fits-all approach to landing page optimisation. Remember: your conversion rate is unique to your business, and instead of obsessing over conflicting data and misleading conversion rate benchmarks, you need to optimise your landing pages for your own needs, and the needs of your audience. "Remember: your conversion rate is unique to your business." Do you want more leads or better lead insight? After all, lead gen isn't just about the number of leads we have - it's about the quality of leads too. Though additional form fields might reduce conversion rates, the impact might be small; and actually, reduced lead generation may be outweighed by the value gained from improved lead insight. If removing a form field that's important for sales qualification of a lead nets you 50 extra leads per month, is the additional volume worth the time your sales team will invest chasing up unqualified leads? Remember that leads aren't equal, and extra leads generated by removing form fields may be progressively less commited, too. There's no guarantee that what works for one company will work for you. The only sure-fire route to improved lead generation is to experiment, analyse your results, and experiment again. It doesn't matter whether you halve form fields or double them: as long as you're generating a bigger return on your sales & marketing investment. Whether you're using three form fields or ten, it's important to use them in the smartest way possible. HubSpot's Smart Fields allow you to progressively profile your leads. By using conditional logic to change form fields based on the information they've previously shared, you can eliminate unnecessary form fields without losing out on lead insight. To learn how to generate more qualified leads for your SaaS business, download our eBook below.